Born: Tiberius Hemsterhuys,1685, Groningen; Edward Coke, Lord Chief Justice, 1551-2, Mileham; John Philip Kemble, actor, 1757, Prescot. Died: Pope Alexander VIII, 1691; Charles Duke of Shrewsbury, 1717; Sir Hew Dalrymple, President of the Court of Session, 1737; William Aiton, botanist, 1793, Kew; Dr. John Lempriere (Classical Dictionary), 1793; Edward Donovan, naturalist, 1837; Mary Woolstoncraft Shelley (ne'e Godwin), novelist, 1851. Feast Day: St. Ignatius, bishop of Antioch, martyr, 107. St. Rionius, priest and martyr, 250. St. Kinnia, virgin of Ireland, 5th century. St. Bridget (or Bride), patroness of Ireland, 523. St. Sigebert II, King of Austrasia, 656. Ignatius occupies an important place in the history of Christianity, as an immediate disciple and successor of the apostles. As bishop of Antioch, in which position he acted for forty years, he is admitted to have been a perfect model of virtue and pious zeal. Under the Emperor Trajan, this holy man was sent to Rome to be devoured by wild beasts -a martyrdom to which he submitted with the usual resignation and joy. What was left of the feeble old man was carefully brought back to Antioch, and preserved for the veneration of the faithful. There are, however, more important relics of the martyr in four epistles, a translation of which was published by Archbishop Wake, in 1693. In burp Duno tumulo tumulantur in Imo Brigicla, Patricius, atque Columba pins. For some cause or other Bridget was a popular saint in England and Scotland, where she was better known by the corrupted or abbreviated name of St. Bride, and under this name a number of churches were dedicated to her. We need only mention St. Bride's Church in Fleet-street, London. Adjoining to St. Bride's Churchyard, Fleet-street, is an ancient well dedicated to the saint, and commonly called Bride's Well. 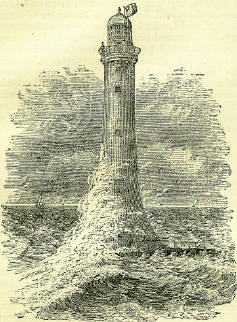 A palace erected near by took the name of Bridewell. This being given by Edward VI to the city of London as a workhouse for the poor and a house of correction, the name became associated in the popular mind with houses having the same purpose in view. Hence it has arisen that the pure and innocent Bridget-the first of Irish nuns-is now inextricably connected in our ordinary national parlance with a class of beings of the most opposite description. The fortunes of this distinguished nobleman present a remarkable instance of the attainment of the highest honours of rank and state, but limited to his own individual enjoyment of such distinctions. He was the elder son of the eleventh Earl of Shrewsbury, who died of a wound received in his duel with George Villiers, second Duke of Buckingham, at Barnes. He was born in the year of the Restoration, and had Charles the Second for his god-father. In 1691, he was created Marquis of Alton and Duke of Shrewsbury, and installed a Knight of the Garter. His grace was a prominent statesman in the reigns of William and Mary, Queen Anne, and George I, and filled some of the highest official situations. He had quitted the Church of Rome and become a Protestant in 1679, and by his steady adherence to the Protestant cause had incurred the displeasure of James II. He was one of the seven who, in June 1688, joined the celebrated association, inviting over the Prince of Orange. At the demise of Queen Anne (who delivered to him the Treasurer's staff on her death-bed), the Duke of Shrewsbury was, at the same time, Lord Lieutenant of Ireland, Lord High Treasurer of Great Britain, and Lord Chamberlain,-a circumstance, says Sir Bernard Burke, (Peerage and Barotnet-age, edit. 1862,) previously unparalleled in our history. His grace, on that occasion, secured the Hanoverian accession, by at once signing the order for proclaiming George I. The Duke married the daughter of the Marquis of Palliotti, but died without issue, when the dukedom and marquisate expired, and the earldom, &c., reverted to his cousin. A Moorish king, who had entertained, with great hospitality, a British captain trafficking on the coast of Africa, reposed such confidence in him as to intrust him with his son, about eighteen years of age, and another sprightly youth, to be brought to England and educated in the European manners. The captain received them, and basely sold them for slaves. He shortly after died; the ship coming to England, the officers related the whole affair; upon which the Government sent to pay their ransom, and they were brought to England, and put under the care of the Earl of Halifax, then at the head of the Board of Trade, who had them clothed and educated. They were afterwards received in the higher circles, and introduced to the King (George II) on the 1st of February. In this year they appeared at Covent Garden Theatre, to see the tragedy of Oroonoko, where they were received with a loud clap of applause, which they returned with 'a genteel bow.' The tender interview between Imoinda and Oroonoko so affected the Prince, that he was obliged to retire at the end of the fourth act. His companion remained, but wept all the time so bitterly, that it affected the audience more than the play. In the neatly kept churchyard of Kew, in Surrey, rest the remains of William Aiton, 'late gardener to his Majesty at Kew,' a reputation which he largely extended by the publication of the famed Catalogue of Plants in the royal gardens, entitled the Hortus Kewensis. He had been superintendent of the gardens from their first establishment; and in honour of his professional abilities and private worth, at his funeral the pall was supported by Sir Joseph Banks, the Rev D. Goodenough, Dr. Pitcairne, Mr. Dundas (of Richmond), and 'Zoffany, the painter. 'Madam,' said Dr. Johnson, in a conversation with Mrs. Knowles, 'we have different modes of restraining evil: stocks for the men, a ducking-stool for women, and a pound for beasts.' On other occasions, the great lexicographer speaks very complacently of the famous remedy for curing shrews, so much approved by our fore-fathers, but, fortunately, already a little out of fashion in the worthy Doctor's time. One of the last instances on record in which the ducking-stool is mentioned as an instrument of justice, is in the London Evening Post of April 27th, 1745. 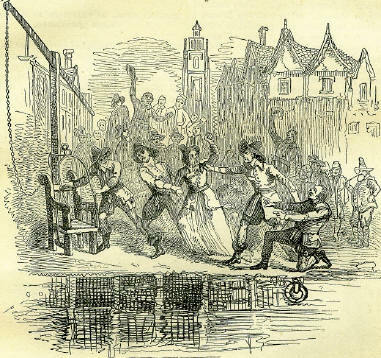 'Last week,' says the journal, 'a woman that keeps the Queen's Head ale-house at Kingston, in Surrey, was ordered by the court to be ducked for scolding, and was accordingly placed in the chair, and ducked in the river Thames, under Kingston bridge, in the presence of 2,000 or 3,000 people.' According to verbal tradition, the punishment of the ducking-stool was inflicted at Kingston and other places up to the beginning of the present century. However, the 'stool' was but rarely used at this period; though it was very extensively employed in the sixteenth and seventeenth centuries. M. Misson, an intelligent Frenchman, who travelled in England about the year 1700, gives the following interesting description of the ducking-stool. An illustration exactly answering to this description is given as the frontispiece of an old chap-book, entitled Strange and Wonderfel Relation of the Old Woman who was drowned at Ratcliff Higlhway, a fortnight ago. Apparently, in the case of this aged person, the administrators of the punishment had given a dip too much; and, of course, in such rough proceedings, a safe measure must have been difficult to hit. 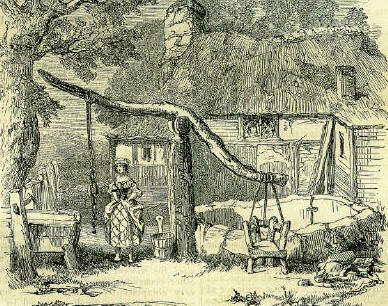 A second illustration, which has been furnished by a gentleman well acquainted with English village life, represents the apparatus as erected close to a watering trough, into which the patient, of course, was let down by the cross-tree, from which the seat depended. Presuming this to be the place whither the females of the village resorted for supplies of water for domestic purposes, we must see that the site was appropriate; for, somehow, places where water is obtained, are often the scene of very fiery displays. That stool, the dread of every scolding queen. In Leicester, in 1457, a scold was put upon the cuck-stool before her own door, and then carried to the four gates of the town. The practice seems a strange example of the taste of our ancestors; yet in connection with the fact, it is worthy of being kept in mind, that among the ceremonies formerly attending the installation of the Pope, was the public placing of him in a similar chair, called the Sedes Stercoraria, with a view to remind him that he was after all but a mortal man. This rather expensive cucking-stool must have been in very frequent use in the good town of Kingston; for in the old account books there are numerous entries of money paid for its repairs. In fact, Kingston seems to have enjoyed quite a preeminence in the matter of shrews, to judge by the amount of money laid out in their taming. Shrewsbury itself lags far behind in the cold-water cure; for, as stated in the History of Shropshire, it was only in the year 1669 that an order was issued by the corporation of the town, that 'a ducking-stool be erected for the punishment of scolds.' The ducking-stool, the oldest known remedy for evil tongues-so old, indeed, that it is mentioned in the Doomsday Survey, in the account of the city of Chester-was superseded to a certain extent, in the seventeenth century and later, by another piece of machinery, called the Bran ice. The branks was homoeopathic rather than hydropathic; and connoisseurs were enthusiastic in asserting that it possessed great advantages over the ducking-stool. To curb women's tongues that talk so idle. Tradition alleges that the instrument was given for the use of the parish by a neighbouring gentleman, of the name of Chester, who lost an estate through the indiscreet babbling of a mischievous woman to an uncle, from whom he had considerable expectations. This Walton bridle -which may still be seen in the vestry of the parish church-is a far less terrible-looking engine than Dr. Plot's. It is made of thin iron, and so contrived as to pass over and round the head, where the whole clasps together, and is fastened at the back of the neck by a small padlock. 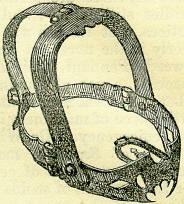 The bridle-bit, as it is called, is a flat piece of iron, about two inches long and one inch broad, which goes into the mouth, and keeps down the tongue by its pressure, while an aperture in front admits the nose. There are still numerous specimens of branks preserved in different private and public antiquarian collections throughout England. There was, until lately, a brank in the old Chester-field poor-house, Derbyshire; and there is still one at the Guildhall, Lichfield; one at Hamstall-Ridware, Staffordshire; one at Walsall, near Wolverhampton; and one at Holme, Lancashire. There was one in the town-hall at Leicester, now in private hands in that town. A brank which is recorded in 1623 as existing at Macclesfield, and is still seen in the town-hall, has been actually used, as stated by a writer in the Archaeological Journal of September 1856, within the memory of an aged official of the municipal authorities in that town. In Scotland, likewise, there are sundry specimens of gossips' bridles still extant; and it seems, from various notices, that its use was quite as frequent formerly in the northern kingdom as south of the Tweed. 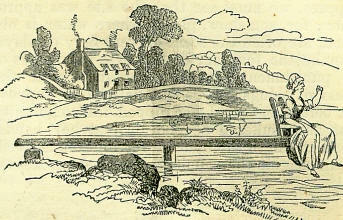 Pennant, in his Taur in Scotland, in 1772, records its use at Langholm, in Dumfriesshire, where the local magistrates had, it appears, their little piece of machinery in constant readiness for any emergency. Dr. Wilson, in his Prehistoric Annals of Scotland, mentions the brank as a Scottish instrument of ecclesiastical punishment, for the coercion of scolds and slanderous gossips. The use of the apparatus occurs in the Burgh Records of Glasgow as early as 1574, when two quarrelsome females were bound to keep the peace, or, on further offending, 'to be brankit.' In the records of the Kirk Session at Stirling, for 1600, 'the brankes' are mentioned as the punishment for a shrew. In St. Mary's church, at St. Andrew's, a memorable specimen still exists, known as the 'Bishop's brank,' sketched and noticed in the Abbotsford edition of The Monastery. Ducking-stools and branks, however, with all their terrors, seem to have been insufficient to frighten the shrews of former days out of their bad propensities. In addition to them the terrors of the Ecclesiastical Courts were held over their heads, as seen, among others, in the records of the diocese of London, which contain numerous entries of punishments awarded to scolds. The same in the provinces. In 1614, dame Margaret, wife of John Bache, of Chaddesley, was prosecuted at the sessions as a 'comon skould, and a sower of strife amongste her neyghbours, and hath bynn presented for a skoulde at the leete houlden for the manour of Chadsley, and for misbehavying her tonge towards her mother-in-law, at a visytacon at Bromsgrove, and was excommunicated therefore.' The excommunication appears to have had little effect in these and other cases; for only a few years after the date above recorded, the magistrates of the town of Kidderminster, not far from Chadsley, voted the purchase of 'a bridle for scolds.' Whether the 'bridle' was ever more popular than the stoole' is an open question; but, at any rate, both carried it, in the majority of instances, over the thunder of the Church. The thing called excommunication somehow never did thrive in England-not even for the taming of shrews. From an inventory of the effects of Reginald Labbe, a small farmer, who died in 1293, we obtain a curious view of the circumstances of an individual of the agricultural class, at that early period. Reginald Labbe died worth chattels of the value of thirty-three shillings and eight pence, leaving no ready money. His goods comprised a cow and calf, two sheep and three lambs, three hens, a bushel and a half of wheat, a seam of barley, a seam and a half of fodder, a seam of 'dragge' or mixed grain, and one halfpenny worth of salt. His wardrobe consisted of a tabard, tunic, and hood; and his 'house-hold stuffe' seems to have been limited to a bolster, a rug, two sheets, a brass dish, and a tripod or trivet, the ordinary cooking apparatus of those times. Possessing no ready money, his bequests were made in kind. A sheep worth ten pence is left to the high altar of 'Neweton,' perhaps Newton-Valence, near Alton, Hants; and another of the same value to the altar and fabric fund of 'Eakewode,' possibly Oak-wood, near Dorking, Surrey. His widow Ida received a moiety of the testator's cow, which was valued at five shillings, and Thomas Fitz-Norreys was a co-partner in its calf, to the extent of a fourth. It is worthy of note, that the expenditure of the executors upon the funeral, the 'month's-mind,' and in proving the will of Reginald Labbe, consumed some-thing more than a third of all he left behind him, being in the proportion of 11s. 9d. to 33s. 8d. Some of the items are singular. One penny was paid for digging his grave, twopence for tolling the bell, six-pence for making his will, and eightpence for proving it, 'with the counsel of clerks;' in other words, under legal advice. We may safely multiply these sums by fifteen, perhaps by twenty, to arrive at the value of money in the thirteenth as compared with the nineteenth century; and by this process we shall find that the lawyer or clerk who prepared the will received a fee not greatly disproportioned to the modern charge for such professional assistance. The mourners bidden to the funeral, some of whom, probably, bore Reginald's body to its resting-place, were refreshed with bread and cheese and beer to the amount of six shillings: the same homely fare at the 'month's-mind' cost the estate two shillings and eightpence. The scribe who prepared this account for the executors was remunerated with threepence, a large sum having regard to the amount of labour. The document is in Latin, from which Mr. Hudson Turner prepared the preceding abstract.